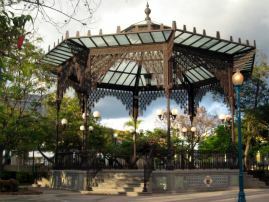 Inaugurated in December 1995 at a cost of USD $11 million, the award winning Dora Colon Clavell Park in Ponce is very close to the town square and one of the city’s finest. It is located on a 7.600 square meters lot right where the old Ponce hospital Santo Asilo de Damas once stood for many years. 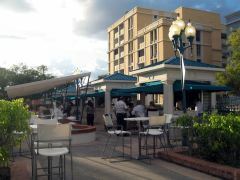 Besides its tranquil gardens and a main yard full of gorgeous “flamboyán” trees, the facilities encompass two levels of FREE underground parking for 300 vehicles plus an impressive crystal-covered central pavilion, reminiscent of the legendary Arab kiosk built for the 1882 Ponce Trade Fair expo. The elegant iron and glass pavilion was brilliantly designed by José Carlos Villaró, a Spanish architect from Málaga. The Dora Colon Clavell Park received the 1995 Outstanding Project Award by the Puerto Rico chapter of professional engineers and surveyors (CIAPR) as well as a special mention in the renowned Engineering News magazine. artisanal coffee and some local, Italian & Mexican delicacies available for breakfast, lunch and dinner, seven days a week. The passive park was respectfully dedicated to memorable and kind (Dorinda) Dora Colon Clavell , born in Ponce (1906-1984) as the oldest of seven children of the then Ponce Property Registrar, Don Luciano Colón Santiago and Doña Ana Clavell Rodríguez. A candidate for the Puerto Rican Independence Party during the 1948 elections, Dora was the first woman ever to run for Ponce Mayor. She was also the mother of four distinguished Puerto Rican jurists, including a former Puerto Rico governor (Rafael Hernández Colón).